Self Service Steam Car Wash Vacuum Cleaners are intended for self service upholstery washing and disinfection with steam. These are the first machines on the market which let drivers wash and disinfect their car upholstery on their own and enjoy short drying time. 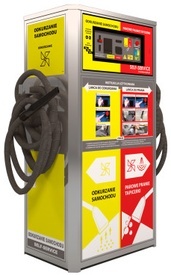 Self service devices have been designed with petrol stations and self service touchfree car washes in mind to let them extend their range of services and attract new customers. Self-Service steam cleaners are the answer to the needs of touchfree car wash customers who want to wash their car upholstery on their own. This machines fill the last existing gap in the touchfree car wash segment. Self Service Plus is a Steam Car Wash Vacuum Cleaning machine intended to wash and disinfect upholstery with steam by the driver himself (in a self service mode). It is equipped with a detergent responsible for cleaning stubborn dirt. Self Service Combo is a Steam Car Wash Vacuum Cleaning machine intended for upholstery cleaning on one’s own as well as standard, self service vacuuming. Two separate features let the machine adapt better to the user's needs. Self Service Max is a Steam Car Wash Vacuum Cleaning Machine equipped with three functions. It serves as a an upholstery cleaning machine, as a regular self service vacuum and as a compressor to inflate tires. Three different features allow the investor to maximize his profit.